Team’s New Look Pays Homage to Brooklyn’s Legendary Hip-Hop Icon, The Notorious B.I.G. BROOKLYN – The Brooklyn Nets are spreading love for the borough’s iconic hip-hop star, The Notorious B.I.G., with the team’s 2018-19 Nike City Edition uniform. The black uniform features a multi-color “Brooklyn Camo” pattern inspired by the iconic rapper, which runs down the sides of the jersey & shorts, and along the neck and arm trim. The pattern represents the cultural diversity in the borough, which is home to people of all races, religions, and ethnicities, who have one important unifying trait – Brooklyn swagger. Placed above the jersey’s jock tag is an original *BED-STUY* mark designed by local renowned graphic artist Eric Haze, which shouts out the neighborhood where Biggie grew up. The Nets and JetBlue have also unveiled a branded plane, “BK Blue.” Straying from JetBlue’s traditional blue paint scheme, the all black-and-white aircraft includes the Nets logo on the tail and the silhouette of the skyline of Brooklyn, including the Brooklyn Bridge and Barclays Center, on the fuselage. The aircraft also features the phrase “Spread Love,” tagging the belly of the plane. The Nets also visited the Christopher Wallace Courts in Bed-Stuy this afternoon where players D’Angelo Russell and Rodions Kurucs ran a hoops clinic and gifted basketballs to youth from the neighborhood. In the coming weeks the Nets will announce additional community activations in support of the City Edition platform. The Nets will debut the jerseys on court on Nov. 17 in a matchup against the Clippers at Barclays Center, and will wear them for a total of 16 games. 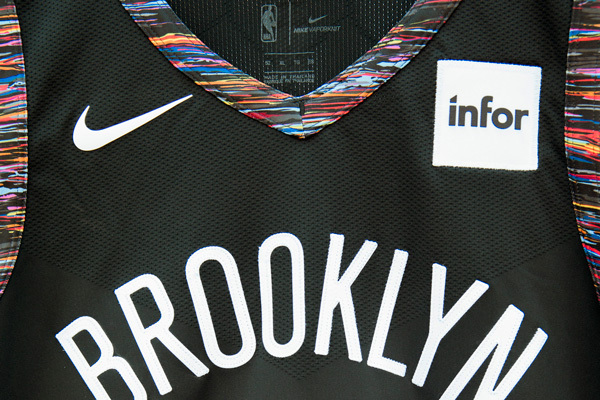 As with all Nets uniforms, the jersey will feature the Infor patch on the top left chest. The jerseys will be available at netsstore.com on Nov. 9 at midnight, and at the Swag Shop at Barclays Center at 9 a.m. Fans can guarantee a jersey by purchasing the City Edition Plan, a five-game ticket package that includes one jersey per seat and tickets to five marquee games during which the team will be wearing the uniforms. More information on the plan can be found here. A full schedule of games in which the Nets will wear the City Edition uniform is below. Fans can follow along at #WeGoBIG. *21st anniversary of the passing of The Notorious B.I.G. Nov. 17 Clippers 6:00 p.m.
Nov. 30 Grizzlies 7:30 p.m.
Dec. 7 Raptors 7:30 p.m.
Dec. 8 at Knicks 7:30 p.m.
Dec. 14 Wizards 7:30 p.m.
Dec. 18 Lakers 7:30 p.m.
Dec. 21 Pacers 7:30 p.m.
Jan. 11 at Raptors 7:30 p.m.
Jan. 25 Knicks 7:30 p.m.
Feb. 4 Bucks 7:30 p.m.
Feb. 8 Bulls 7:30 p.m.
Feb. 21 Trail Blazers 7:30 p.m.
March 1 Hornets 7:30 p.m.
March 9* at Hawks 7:00 p.m.
March 11 Pistons 7:30 p.m.
April 10 Heat 8:00 p.m.